Ice cream soap is perfect to give out as a party favor for an ice cream party or sweet shop party. 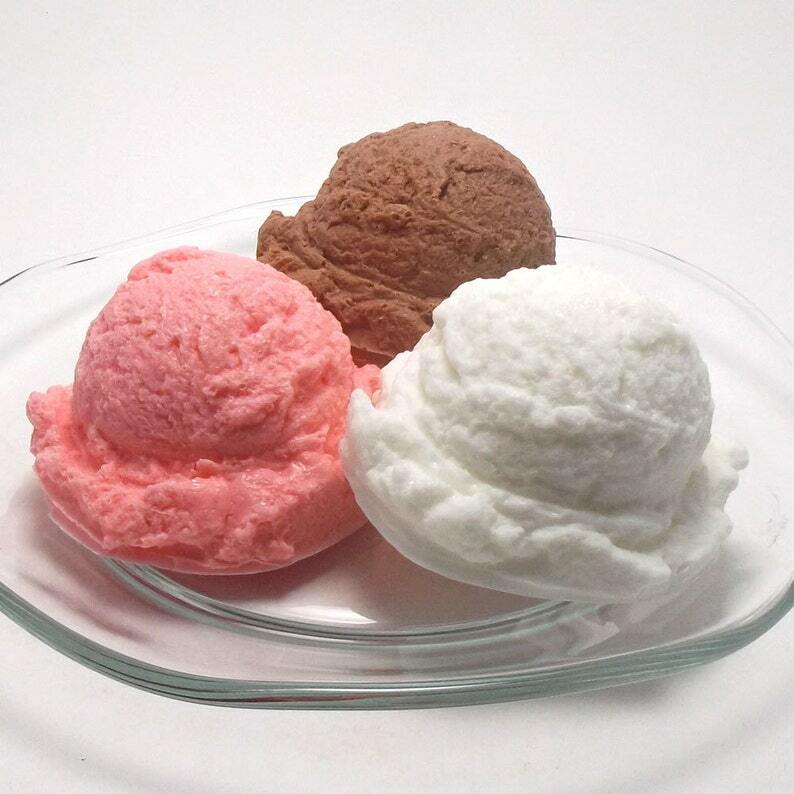 Ice cream soap is fully detailed with nooks and crannies just like real ice cream. Scented in your choice of vanilla (white soap), chocolate (brown soap), strawberry (pink soap), mint chocolate (mint green soap), pistachio (mint green soap), black raspberry (purple soap), coffee (brown soap), and butter rum (yellowy brown soap). Soap makes great holiday soap gifts, mothers day gifts, and hostess gifts. Ice cream weighs approximately 3.75 oz. Ice cream is approximately 3" l x 2 3/4" w x 1.5" h.
1) Message for your custom tags. See last picture for tag choices. Ingredients: Glycerin (kosher, of vegetable origin), Coconut Oil, Palm Oil, Safflower Oil, Purified Water, Sodium Hydroxide (saponifying agent), Sorbitol (moisturizer), Sorbitan oleate (emulsifier), Oat protein (conditioner), Fragrance, Titanium Dioxide, Color/Iron Oxide/Mica. May contain FD&C/D&C colorants. Super cute product, beautifully wrapped and fast shipping!